Grown for the leafy foliage Tetragonia tetragonioides is commonly called Warrigal Greens as well as New Zealand Spinach. The leaves are cooked like spinach and do need to be blanched and rinsed before eating to remove the toxic oxates. 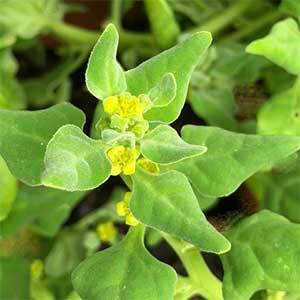 It is recommended the you consult an expert in peroration of Warrigal Greens before eating these plants. Common uses are as a spinach substitute, as an interesting component of pesto. You can also use them stir fry, frittata, and similar dishes. The important factor is to blanche then properly and rinse them before eating. Warrigal Greens are easy to grow in the right conditions. The natural habitat is in damp areas along creeks and streams, these areas usually have fertile soils as well. Light shade is another factor. You can grow these plants in containers if required. This is a plant that is easily pruned and is regularly harvested for the leaves. Drought tolerant – Young plants will require some water during long dry periods. Tetragonia tetragonioides or Warrigal Greens are available from the following nurseries.